Accepting your faults and weaknesses is a hard thing to do. But through the right knowledge from personal experience and repetetive cruelty from others makes you feel guilty or sorry for your actions. The truth is all your emotional pain, emotional suffering and all your negative emotions can be your main strength to completely redirect your negative behavior and turn those actions and traits into a positive definite solution to improve yourself spiritually, emotionally and physically. There are eight positive traits that were actually expounded in this ebook. Traits that are tools to develop your personal relation to your partner or spouse. 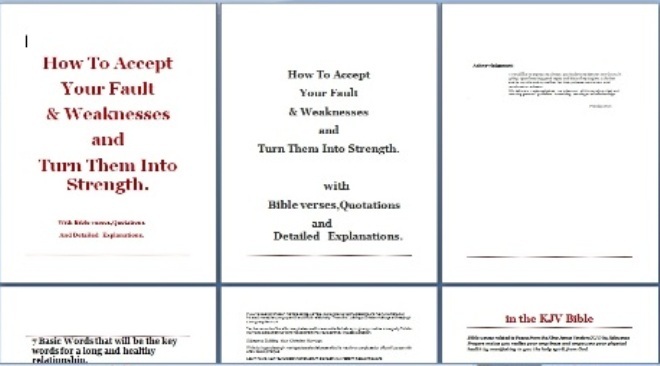 There were christian ways taught in this topic to step by step develop your emotional stress into strengths. This serves as major steps to actually reverse your emitional negativity into a fruitfully positive relation to others specifically to your partner or spouse. Realizing your weakness and having the courage to concede , accept your mistakes and look for a solution to resolve it within yourself before you can solve your marriage or any relationship.